There are those who take trips and those who travel. Jaqueline and Lee Bouvier were a trip when they traveled. One crazy summer abroad is chronicled by the (then) girls in a book handwritten (by Lee) and illustrated (by Jackie) to present to their parents as a thank you upon their return from a different world. And what a different world it was in 1951 when the twenty-two year old Jackie and her eighteen year old sister took their first trip to Europe together. Join Jackie and Lee for a tantalizing glimpse of a lost world: crossing the Atlantic by ocean liner, visits with counts and ambassadors in Paris, art lessons in Venice, and white gloves in the afternoons. Smile at the social agonies all young women suffer in common — how to politely consume an oversized hors d’oeuvre, the horror of slipping undergarments, and the art of fending off unwanted romantic advances. 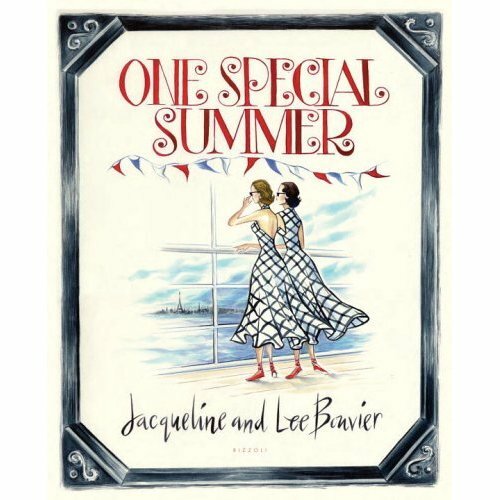 “One Special Summer” is summer fun, gift-wrapped for us by two sisters who would become very famous indeed. P.S. speaking of hostess gifts, LucyInStLou has a fantastic post about the best wines to bring along to the party. Read it here. This entry was posted in Cultivating and tagged books, Cultivating, travel. Bookmark the permalink. I’ve searched used book stores everywhere looking for the perfect vintage version of this book. It’s ridiculous that it never occured to me to check Amazon! Thanks so much for mentioning this. I’m off to do some cyber-shopping. Grand plans to do my very own book inspired by this illustrated journal. Looks like the perfect summer read and a great escape! I can’t wait to get it! I checked out this book from the public library awhile back. It was a lovely tale of Jackie and her sister in a simpler time… when young girls could travel around Europe unescorted. Yes, such a charming book. Love how you put this together. I love that you know this book and featured it. This is the firs time I have ever come across anyone else who was familiar with it. I thought the whimsical drawings were lovely. The entire book painted such an engaging picture of another time. It was funny, too. Thanks all. It’s a fun little read. Breezy. As I wish we all were. Mrs. PvE., please reserve me several autographed copies as I will be distributing them to loved ones as gifts. Hello and welcome Relyn, I wonder, if we all tried very hard, don’t you think that we could regenerate a little of the charm of that lost time? It’s been on my list for a few years now! I guess I need to pop over to Amazon! So many books, so little time. I have yet to read this book, but based on your recommendation E&E, I’ve moved it to the #1 position on my wishlist!